By Robert Roy Britt — A grassroots group seeks to combine New River and Desert Hills into one formalized town, in order to have some control over what many perceive as out-of-control development in a region where the primary water supply—an underground aquifer—has been dropping for decades. But there are significant hurdles to incorporation, and a number of residents are now voicing opposition to the effort. 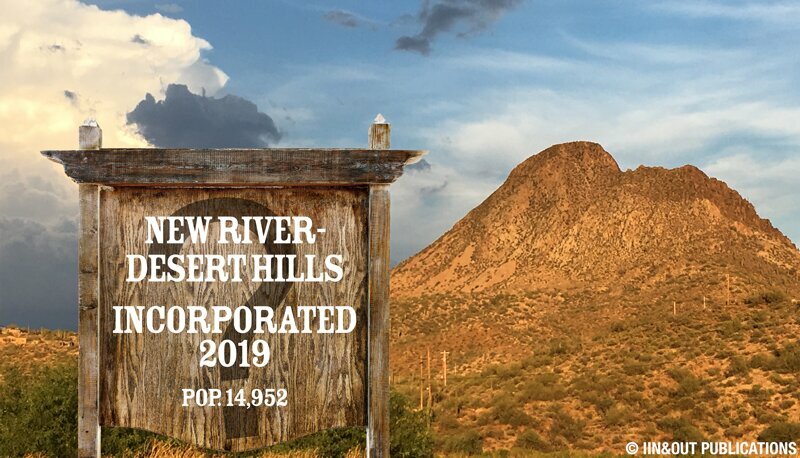 At an Aug. 29 public meeting organized by the New River–Desert Hills Incorporation Committee and attended by roughly 300 people, Tom Belshe, deputy director of the Arizona League of Cities and Towns, discussed what it takes to become a town and what it means to run one. The league promotes local self-government and municipal independence. Amid many questions, several residents spoke passionately both in favor of and against incorporation. Belshe said he is not “for” or “against” incorporation in any specific case. Rather, he presented facts to inform those who would eventually vote on it. Belshe was not paid for his presentation, but he is paid by the league, which is funded by the towns and cities it represents. Continue reading below to learn how the process works, the pros and cons, what responsibilities a town must take on. Or see the sidebar: The New-River Desert Hills Budget Proposal. A proposed town must “be a community” of at least 1,500 people (as measured by the Census Bureau) who live in the same general geographic area and share common interests in health, fire, water and other common aspects of municipal life, Belshe explained. The incorporation committee says the area has a population of 14,952. File with the county recorder a petition to incorporate, including a boundary map. Within 180 days after filing, get 10 percent of registered voters within the boundaries to sign the petition. If incorporation passes, the County Board of Supervisors would appoint the first council, to be comprised of people who live in the new town. The town can begin collecting some shared revenues (see below) immediately, but is not responsible for providing services until the start of the next fiscal year, which in Arizona officially begins on July 1. For this reason, Belshe said, it can be advantageous to get the initiative on the ballot in August—as opposed to other state election-day options, which are typically in November, March and May— allowing more than 10 months to collect revenue and ramp up operations without having to fund services. The town needs an official meeting place, even just a rented building. Two key positions, at minimum, should be filled: A town clerk/administrator and at least one experienced accountant. Also needed: legal services (which can be contracted) and liability insurance. A town is not required to provide parks, libraries, sewer or water systems, and the incorporation effort does not include water in its plans. Laurie Ricci, one of the four people who started the incorporation committee, agreed. “Incorporation wouldn’t be mutually exclusive of the proposed water district; they can work hand-in-hand to create a solution,” she said. More self-determination politically and ability to focus on local issues. Ability to plan and deal with growth, and more standing in courts and with state and federal governments on development and water issues. Greater ability to establish and/or contract for additional services such as increased sheriff deputy patrols. Shared revenue from the state. It’s another unnecessary level of government. Rural character may be lost or retained, depending on goals and strategies of the new town council. Revenue may not be sufficient to pay for necessary or desired services. Residents may end up paying more in sales tax (if they vote to enact a local sales tax). While a new town may not need or wish to institute new local taxes, “all of the cities and towns in Arizona have a local sales tax. This tax is the most important source of local revenue for most municipalities,” according to the League of Cities and Towns. 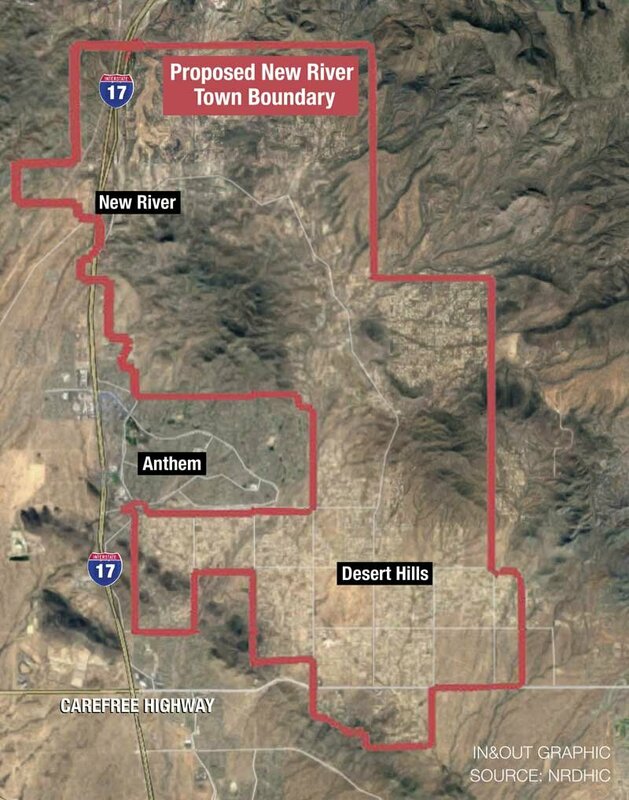 Anthem officials oppose the group’s proposed boundary map, which includes a portion of Anthem’s commercial district in an effort to potentially produce sales tax revenue [See “Proposed Boundaries of New River Town,” In&Out, Aug. 2, 2018]. While the map lines cross from Desert Hills into southern Anthem, no roads connect the two areas directly. Even some rural residents think the boundaries should not include Anthem. The incorporation committee’s Facebook page had 253 “likes” as of this writing. Shields’ competing page had 174. The incorporation committee, meanwhile, has not committed to any boundary changes just yet. “We have upcoming meetings with the Anthem Community Council and the City of Phoenix and are awaiting their input before making any changes,” Ricci said. The earliest the initiative could be on a ballot would be 2019, Ricci told In&Out, adding that “a lot of factors” would have to align.